Are all these events related? And if so, what's the cause? Those keeping an eye on the Forecaster Notes across southern Australia would be aware of the current negative Southern Annular Mode [SAM]. The SAM is an index representing the north/south position of the westerly storm track. When negative - as we're currently seeing - the storm track is positioned further north and closer to the equator, bringing cold fronts up to southern Australia. Conversely, when the SAM is positive we see the storm track positioned further south, resulting in stable high pressure across southern Australia. As you can see in the graph below, SAM has been negative since late July. However, this is just one piece of the puzzle. As well as a strong negative SAM index, we've seen the Long Wave Trough [LWT] focussed just off Western Australia over the past month and this has exacerbated the situation. The LWT has been steering polar storms up and across the south-west of the country, namely Western and Southern Australia. This explains the prolonged period of large surf across Indonesia and relentless onshore stormy surf across Western Australia, but what about Victoria and the East Coast? The flow on effects of the storm track sitting further north is that Victoria has been receiving endless westerly swells which generally don't bend around Cape Otway into the Surf Coast anywhere near as efficiently as south-west swells. This has also meant persistent north-west offshore winds have generally gone to waste, while there also hasn't been enough north in the wind to clean up the Mornington Peninsula beaches. Further down the line, the East Coast has been the biggest loser, with nearly a month of small surf across southern NSW. The reason for which is mainly due to the negative SAM event but also the position of the LWT to the west. Generally under a zonal (west-east) weather pattern, the storm track will still be positioned far enough south to generate diffracted southerly swells either from eastern Bass Strait or from under Tasmania. But with the storm track shunted north and also dipping east-southeast across New South Wales, the frontal systems pass straight across the country with no chance for any southerly swell to be generated at all for the East Coast. This also prevents any other possible swell generating system developing in the Tasman Sea. Instead we see endless clear sunny skies, clean smooth seas and no swell. This can be easily visualised by the latest Mean Sea Level Pressure anomalies for July (top diagram, below). The anomaly is the difference in surface pressure from the long term climatological average and as expected, we can see that across the south-west of the country, surface pressure was around 3hPa lower than normal, even more through the Southern Ocean. 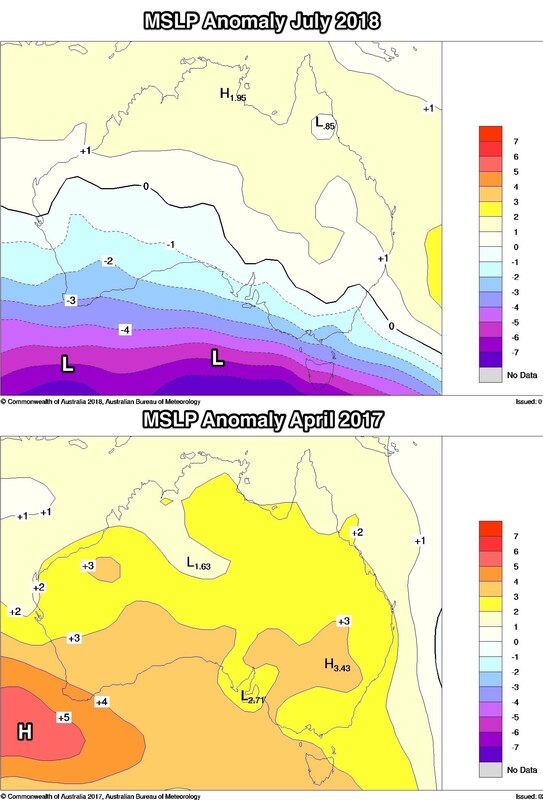 If we compare this to autumn last year when we ran an article explaining the excellent run of offshores and good weather across Western Australia and South Australia, which was linked to strong positive SAM events and higher than normal pressure across most of the country (bottom diagram). When will this setup breakdown? The SAM is tricky to predict, but forecasts have it remaining negative over the coming week or two which will keep the storm track positioned further north than usual. One positive for the East Coast is that we'll see the Long Wave Trough shifting further east and sitting across the Tasman Sea. This will result in the storm track shifting more south-west to north-east across the south-east of the country, though intersected by Victoria. This is likely to slice in half some of the frontal activity, but we'll still see a much more active southerly swell regime developing from this weekend and more so next week. Keep an eye on the regional Forecaster Notes for a run down of your region. As a rule of thumb for Vic. Postive is good surf. Negative is bad? But does a positive also mean a blocking pattern for Vic. Perhaps neutral is best for Vic? Depends which coast, but for swell with more south in it, positive is better. But this depends on where the LWT is positioned. Lots of different combinations and permutations possible. Totally agree, and the data above explains it. I think you need to factor climate change into that analysis Craig. The models show exactly what we are observing, not just in Australia, but globally. The prediction is that systems will become slower moving creating weather patterns which last much longer than usual. We have seen this on the east coast with one of the longest spells of small swell that I can remember accompanied by days of virtually identical weather. In the northern hemisphere there have been long spells of extreme heat in Europe the US and east Asia. why would systems become slower moving BB? I think the most popular theory is because of a slowing jet stream. The jet stream is upper level air that moves very fast. As the polar areas and total ocean temps increase the difference in the temperature from the pole to the equator is decreased and slows these winds or sees them not developer at all. This leads to weather patterns staying still because the upper jet stream is inactive. Another great article Craig. The ABC is also on the case of the negative SAM but relating it to rainfall rather than swell. I did an interview last week with Virginia Trioli (!) on ABC Radio Melbourne, where I discussed the Negative SAM (only relative to winds though). They turned it into a brief article.. but the one you linked to is way more detailed! Great article, I find this very interesting..
"A positive SAM in winter can bring more rain for northern New South Wales and into Queensland because of moist onshore winds. Ms Gamble said there also was some evidence that suggested a high incidence of east coast lows during positive phases of SAM. A negative SAM in winter is almost the opposite — extra rain for the south." freeride, it is all associated with the presence of high-amplitude quasi-stationary atmospheric Rossby waves within a particular wavelength range (zonal wavenumber 6–8). The underlying mechanistic relationship involves the phenomenon of quasi-resonant amplification (QRA) of synoptic-scale waves with that wavenumber range becoming trapped within an effective mid-latitude atmospheric waveguide. So has that cleared it up for you? Certainly what I was thinking. :o Haven't looked into this I have to say BB. Not sure that this will clear things up Craig. I'll read it later to see what I can make out. That was an impressive delivery BB , did Craig let that one through to the keeper? :) Thanks for the article Craig it certainly explains a lot for the current WA winter thus far . Content like this puts SN a cut above the rest, worth every cent. It was a cut and paste from the abstract of the link above nikko. I am still working my way through the paper. By the sounds of that last snippet its gonna take awhile...whew!? Quick take. Rossby waves are the undulations in the jet stream. When they number between 6 and 8 and reach a certain amplitude range the system becomes stable and so stabilises the pressure systems located below it resulting in an extended period of the same weather ....... or something like that. In the Northern Hemisphere, it is supposedly due to the Arctic warming faster than the rest of the hemisphere so the difference in temperature due to latitude is reducing. I also read that the Jetstream in the northern hemisphere is sitting much further north than previous summers. Excellent analysis by all! Certainly a more educated demographic than most comments sections! Craig I'm just wondering are the LWT and SAM related - I made the assumption the negative SAM simply reflected the LWT spinning further north? BB comments regarding decreasing temperature gradients and their effects on stabilizing storms are super interesting! I can see how you could come to that conclusion but no they're not related. Think of the SAM being the position of a west to east race-track around the Southern Hemisphere. When negative it is north and more over Australia, and when positive south of Australia. The LWT is just bumps and bends along this race track regardless of its position. But when we get a LWT node and negative SAM at the same time - the cold weather, fronts and rain all impact Australia with greater force. Thanks Craig that's a very effective analogy. Regarding this statement... "As well as a strong negative SAM index, we've seen the Long Wave Trough [LWT] focussed (sic) just off Western Australia over the past month and this has exacerbated the situation. " Will a positive SAM negatively impact the storm-genesis (to coin a term) of the LWT? And no not at all, it just means the storms will be a bit further away from the continent. 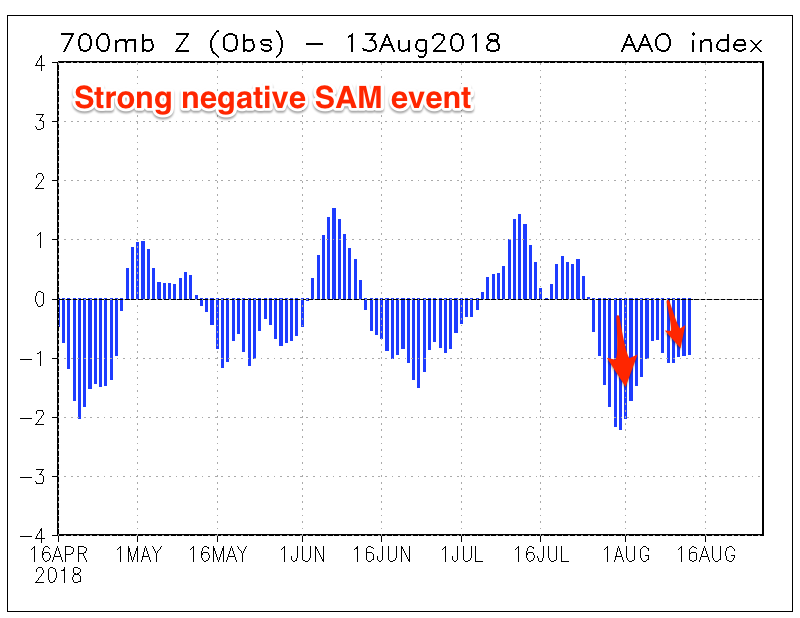 I feel the negative SAM would have more of a negative impact - as we've seen more mid-latitude storms developing the last month, which don't have a tail reaching as deep and as far down into the Southern Ocean. Something worth mulling over. Focused or focussed both OK. As you where.....or were? Been pumping up here in Nor-West Oz keep it up Huey!!!!! Craig just wondering if this has anything to do with the unusual spike in N/NE swells in winter along Tas East Coast. Southerly action has been woeful which your article seems to explain. Hopefuly that changes sometime soon!!! Maybe Monday. Yeah this is more due to all the mid-latitude frontal activity with strengthening pre-frontal N-NW'ly winds ahead of each front. Most haven't been great swell producers besides the ones that have a more N/NE infeed. Glad it's not just me thinking WTF is with all the West swells on the Surf Coast this winter. Been plenty of waves, always slow and inconsistent though and 30-50% smaller than the forecast models for "major swell events". - So on and so on. Don't take me too seriously. Agree with you WRW but they did say the models were over forecasting in the notes. This morning was very lackluster by normal late winter standards. It was still fun but this years sure has been bazaar. Mid period westerly swells really ain't any good around these parts. Still, think of the Pen, East Vicco crew and NSW/QLD. They've had an absolutely shocking run, I wouldn't go drinking too much in a local pub around these part of Australia ATM. Yeah totally agree, there's definitely more tweaks to be made to the algorithm, and this persistent run of west swell has made it much clearer. I have pointed this out in the Forecaster Notes as well, but for those who don't read this, they would find in always over-forecasting. NSW coast? Yep, been discussed at length in the Forecaster Notes since Monday.